Disclosure: This post is sponsored by Kodiak Cakes and all opinions are 100% my own. 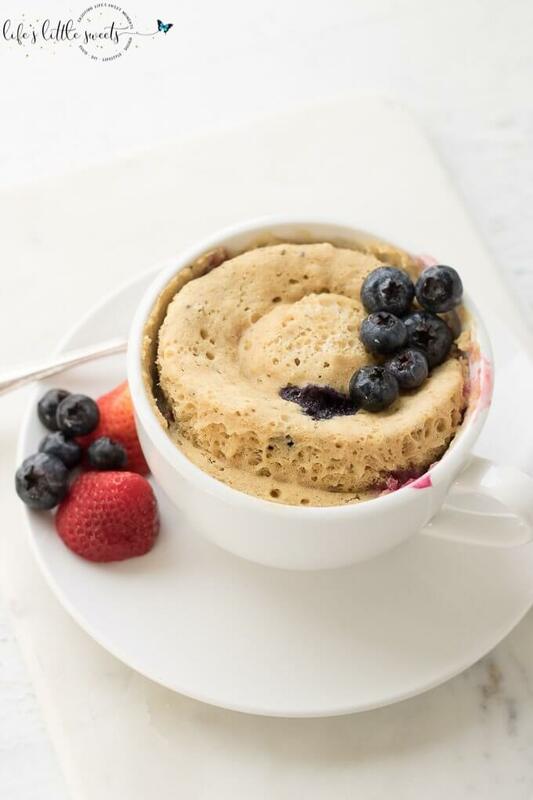 This Easy Breakfast Mug Cake is made with Kodiak Cakes Energy Packed Flapjack and Waffle Mix and topped with raspberries, blackberries, strawberries and blueberries. This is an easy, tasty and satisfying breakfast hack. 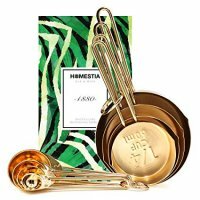 Hi Everyone, I don’t know about you but if I am short on time or if I have a lot to do, I don’t want to spend a lot of time on breakfast. 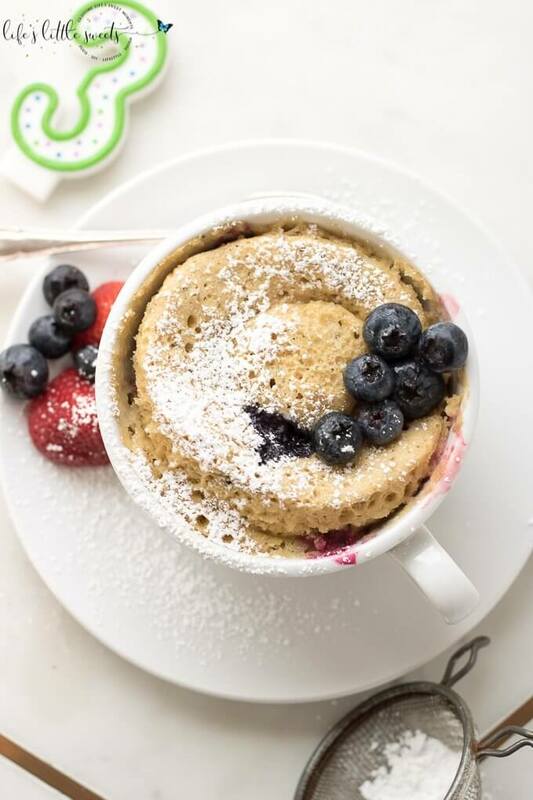 I also don’t want to skip breakfast, so that’s when this Easy Breakfast Mug Cake comes in handy. 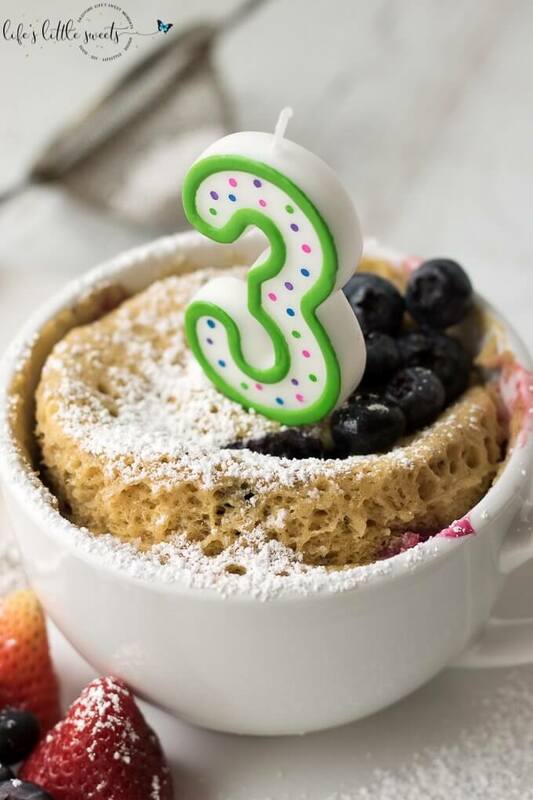 So what’s with the number “3” candle on top? 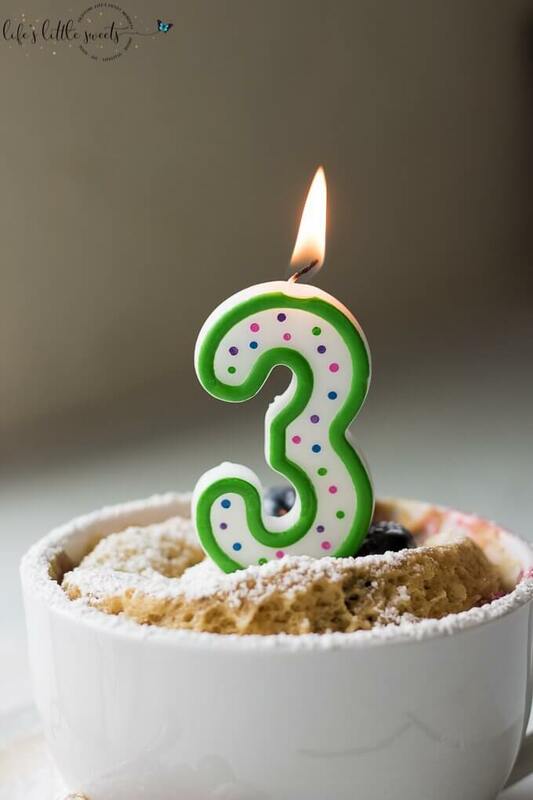 Last month, on 3/12/2018, was Life’s Little Sweets 3rd year anniversary or “blogiversary” as they say. 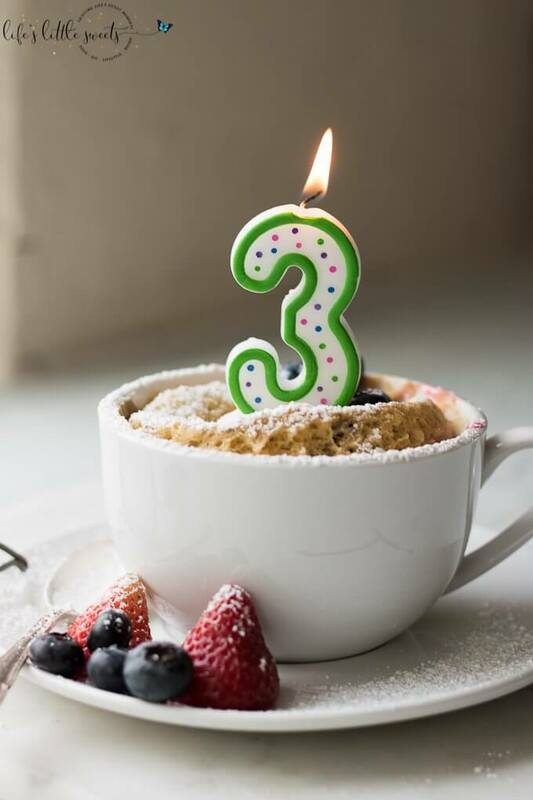 To celebrate, I redid the photos on my first recipe post and made this Easy Breakfast Mug Cake 🙂 I also have reflected on the past 3 years. I didn’t celebrate the 1st or 2nd anniversary of the blog, those dates just came and went because my head was down working and I felt like I hadn’t accomplished as much as I wanted to at the time. What’s different this year? I’m happier with my photography and feel like I’ve developed my style, all the while knowing that I will always be a student and open to learning new things. Overall, I am proud of the body of work here on this blog and I’m always working to improve what’s here and what I produce next. When I started this blog, I didn’t know anything about food photography, I taught myself, cared about the craft and improved my cooking and baking skills along the way as well. I created a business from nothing, coming from a different career and knowledge base, where I can work from home, is flexible for my lifestyle and be with my kids while they are young. To an outsider, that’s kind of making something out of the impossible. I think, to a rational person, I should have stayed in architecture or even sales, stayed close to the city where there are more jobs and where I have more connections but no, I had to be stubborn and do things my way because I had a vision of a life that I want, with my family and a yearning for creating something my own. I really have my husband to thank for supporting me staying home with the children and supporting me exploring the possibility and fruition of this blog. Sometimes, it’s really hard for me to stop and recognize these things, stop and reflect, my tendency is to work after my children and husband are asleep, grind out the work, perfect, edit – do it again, and again, tirelessly, relentlessly until my work resembles something I could be proud of. So here’s to being kinder to oneself, naming perfection as the sometimes enemy, giving oneself grace and seeing the forest through the trees. 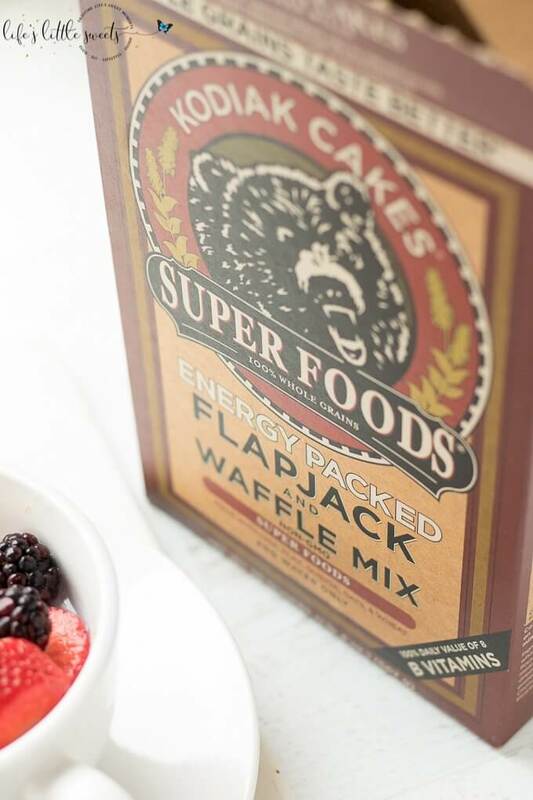 Several months ago my husband Eric came home with Kodiak Cakes muffin mix and the flapjack and waffle mix and we have been hooked on their products ever since. I love that they have 100% whole grain, non-gmo, no preservatives and protein-packed ingredients. 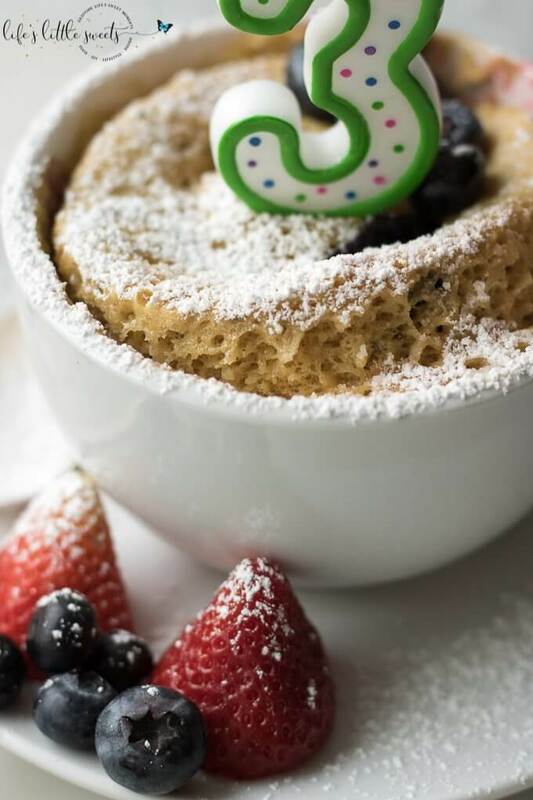 Why a mug cake? Because it’s fast, efficient, is satisfying and doesn’t disappoint me. I think I am always chasing that in some way or another and sometimes making stuff from scratch isn’t realistic for me but taking shortcuts without sacrificing things that matter works. They sent me a box their different products including their Flackjack On The Go (including these flavors: Chocolate Peanut Butter, Blueberry & Maple and Cinnamon & Maple) which were already in cups and you only have to add water and microwave. They were soo good. 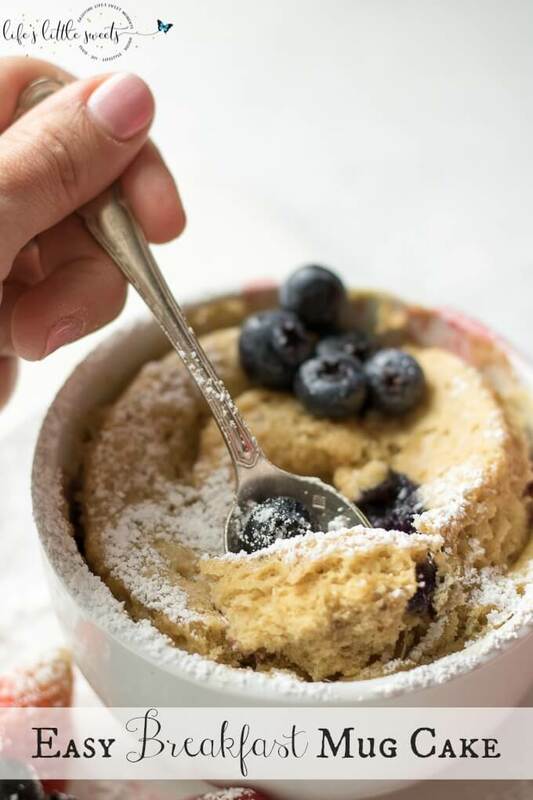 Just look at that lofty mug cake – yum! 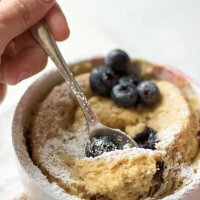 Let me know if you give this Easy Breakfast Mug Cake a try in the comments below! 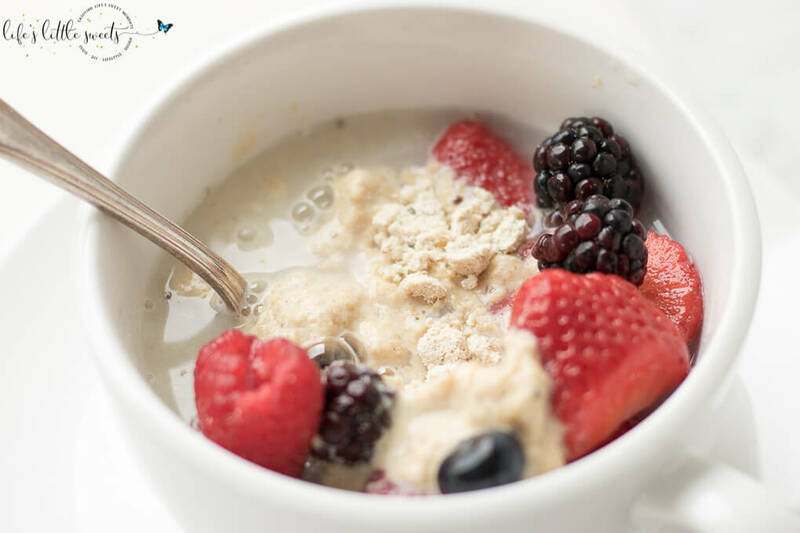 In a large mug or bowl, mix 1/2 cup Kodiak Cakes Flapjack and Waffle Mix, 1/2 cup cold water and 1/4 cup berries. Mix until combined. Microwave for 1 minute, check on it and microwave for another 30 seconds. 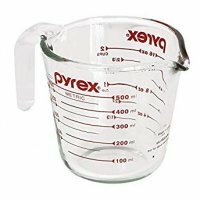 Time may vary depending on your microwave. Optionally sprinkle with confectioner's sugar and extra berries and enjoy! Very easy..but not quite sweet enough..I defiantly chose it because I wanted keep my calories down..I love the prepackages5ones but not cost-effective. Thank you for sharing. 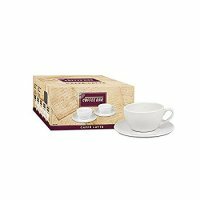 Can you please tell me the nutrion breakdown (if I make it as directed). Thank you again.